We received another provocative email the other day from some friends of ours. We love it when we get emails that get our blood boiling. Keep ‘em coming! It seems that although the legislature was shut down by McGuinty, some of his Ministries are still hard at work ignoring the ordinary people of Ontario. Minister Gravelle from the MNR has decreed, with full support from the Aggregate Industry, (and now the Niagara Escarpment Commission! *) that recycling is just a rubber stamp away from your local pit and quarry. This change is being justified as ‘something the public demands’. Recycling of aggregate materials is supposed to reduce the “need” for more pits producing virgin material. But when ordinary citizens ask if more pits are actually ‘needed’ they are told that they simply can’t ask such questions … it’s against the law according to the Provincial Policy Statement (PPS)! 1. We have over 6,500 pits and quarries in operation in Ontario right now. Allowing recycling is supposed to reduce consumption of ‘virgin’ materials. So do you suppose this might stop the opening of new pits and quarries? Hardly. The PPS is under review, and must change to take into consideration our current abundant supply of materials. But asking the ‘do we need more’ question is still prohibited! 2. Recycling is an industrial operation that does not belong in a mining environment. 3. Because of the potential for mis-handling of the various materials, recycling will require oversight, something the MNR has proven they will not, or cannot do, given their current mandate and personnel resources. So again, it will be left up to the aggregate mine operators to police themselves, something many of them have repeatedly done very poorly. 4. Dust control in pits and quarries is always an issue. Do we really believe that increasing the polluting fumes from machinery, and toxic dust from the operations is a good idea? Processing more material – some of it possibly very toxic – in facilities and under conditions that were never intended for such, seems simply foolish, or worse. 5. Leachates from asphalt and other contaminated materials will make their way into our water table. 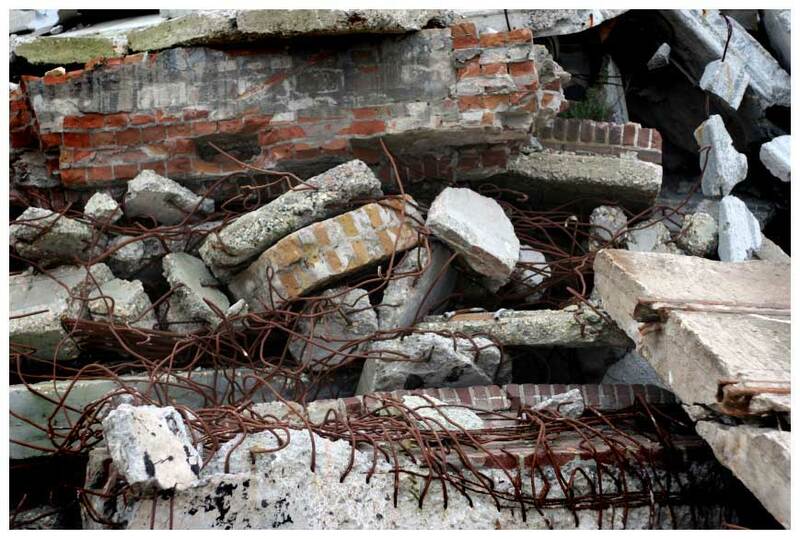 It is unavoidable when you drop this tainted rubble two meters from the aquifer, on porous soil. 6. Furthermore, who will be inspecting the materials coming in for recycling? We know the MNR inspectors can’t do the job. Then who? Where are the regulations and rules designed for this new policy? It’s all left up to the Aggregate Resources Act, which was never intended to deal with industrial recycling facilities. 7. When applying for a license to open a new pit or quarry, the operator and MNR agree that it will be an ‘interim land use’. Adding a recycling operation will obviously increase the life span of a pit. It seems this creates another way to extend an operation indefinitely and avoid rehabilitation, virtually forever. To characterize the push for recycling as something the Ontario public wants is a bit of a stretch. Does ‘the public’ want more recycling? …. Absolutely. Do they want expanded industrial operations, with more huge trucks coming and going from their neighbourhood pit forever? …. Absolutely not! So we’ve asked just how it’s been determined that industrial recycling in gravel pits represents ‘the public’s wishes’. The only answer we’ve heard is that there are Non-Governmental Organizations (NGO’s) and special interest groups voicing their opinions. 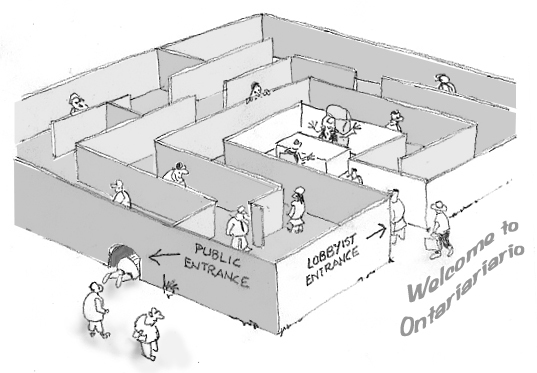 Well, DUH … is it any surprise that the Ontario Stone Sand and Gravel Association (OSSGA) might lobby the government, claiming to represent ‘the public interest’? But …What about input from groups like Gravel Watch, who more genuinely represent the public interest – and WITHOUT the taint of ties to Industry! Have they been heard? Apparently NOT. Industrial recycling operations should be located in industrial areas, not in open pit mines that are often located in rural residential areas. But recycling is just one part of a bigger picture. It must be implemented with a comprehensive and well thought out plan. As it impacts the future of aggregate mining, it must deal with questions of ‘need’, resource life-cycle management, transportation, alternative materials, and full cost financial accounting . To hand recycling responsibility to the MNR and their aggregate industry friends without such thorough consideration is dangerously short-sighted. Once again, the MNR and Minister Gravelle appear to have demonstrated a lack of understanding of their portfolio responsibilities, and once again, the aggregate tail seems to be wagging the dog. In short, the MNR’s handling of this issue seems superficial and inadequate, serving the wishes of their cronies at the expense of ordinary citizens! Is this acceptable? What can be done? Are ordinary citizens willing to do anything about it? Who owns this province anyway? … You? … or the politicians and their ‘insider’ friends? So, since you don’t have preferred access to the decision-makers, we suggest it’s time to call, email and write your MPP, to tell them that weakening the Niagara Escarpment protections is completely unacceptable. Call, email and write Minister Gravelle and all opposition critics. Try to be civil, which might be difficult, and tell them it is time the aggregate industry stopped dictating policy in Ontario – starting with this recycling-in-pits fiasco. Call, email and write your local newspapers and news web sites. Tell them these sorts of policies are bad for our province. It’s time for a concerted effort to send the message to OUR elected officials that we will be Silent No More. After all, they are supposed to be working for US! Next postGetting Stoned … or Getting Out of the Stone Age? What do the employees of these facilities say? Most of these facilities are in rural areas. Probably most of those living within their proximity are neither benefiting from them in any way (beyond their own miniscule aggregate needs) nor dependant on them for their daily bread. Take these folks out of the equation, what’s left? Likely just some farmers and employees and owners of the service businesses around the remainder. In their lives these facilities are important and likely appreciated. Certainly, how they conduct their day to day operations will be important to them, but not the continuous argument around their merit and right to exist, which is what I primarily glean from the above. It’s the same, constant wail from the same category of folks that’s been going on for as long as I can remember. Some of these sites are going to be repurposed, whether for houses, farming or recycling of aggregate materials. Let’s ask the employees, direct and indirect, which they’d rather have. If it is for recycling, let’s focus on dealing with the specific problems around it. The real message should be, the slipshod and underhanded way our government works, with this policy review just be one more example. That will surely find favour across a much wider audience and may even eventually lead to some changes. With the right changes, not only would the aggregate industry not be able to dictate public policy, but neither would the drug or communications/media industries, or any other for that matter. And for heaven’s sake, stop whining about all the trucks. How do you think some of us feel living along the north-south corridors to your neck of the woods, now that we can’t even get out of our driveways at certain times of the day, or TO folks who live along the major arteries. 1)	We are not against pits and quarries or their right to exist. Aggregates are an extremely important part of our industry and infrastructure. What we are looking for is a degree of fairness in the system that does not exist right now. Pits and quarries profit, the rest of Ontario gets cheap product, and the neighbours of the pits lose their life savings because the value of their homes plummet. We believe this to be an unrealistic and unsustainable approach to any industry. 2)	There will be ‘x” amount of aggregate used in Ontario this year, and the use of this product will employ a certain number of people, many of them seasonal. The number of people will not change, just the location of the job site. So there is no dependency on new pits and quarries to continue the employment of aggregate workers. The same applies to peripheral and support businesses. 3)	The “Folks” you want to take out of the equation, or to put it another way, the people who live next to the pits and quarries, have already been marginalized by the industry and our government. I don’t think they want to be “removed from the equation” at all. As matter of fact, we believe they would like greater consideration. 4)	This particular posting really is about the shoddy way these changes to the NEP were made. Passed at a time when the government was prorogued, it is suspect as to whether or not it went through the MOE, there is next to zero oversight at the MNR for these operations, and the list continues. It would be nice to see some positive changes in the ways that policies are made and changed, but unless the word gets out there, which is what we’re trying to do, things will remain the same. 5)	We feel your pain re: traffic, wherever you are, but if industrial recycling starts up in pits, then there will be even more trucks. Possibly even at your location. And forget about ‘repurposing’ for houses or farming once industrial recycling gets established there. Thanks for your input and for reading our blog. So what you are saying is the people who we rely on with the say really have no say at all. It’s the fat cats that have all the say which allows us no say. I say we get rid of the middle people with no say and give us the say in what happens with our lives and our environment. Hear what I’m saying? An interesting young gal came into the pub the other night, sitting on her own with her notes etc. An aspiring junior writer who gave me a quote by someone she was researching….”If the economy is more important to you than the environment, try holding your breath while counting your money” I like that one and will find out the source when I see her again. Unless your team knows it’s origin. I wish that the News Papers would look into the matters of the aggregate industry and just how the approvals are given. News papers that once promoted investigative journalism now seem to sit and wait till someone puts the material on their desk. I guess when something happens or when people die then its news, sometimes. No such thing as risk management, and if we allow the aggregate producers to police themselves like they have been doing we are sure to hear of more disasters. In a court transcript the aggregate operater states quite clearly his operation came first regardless of the rules under the AGA, EPA.